Contemporary 4 bedroom, 3 bath home with Water views on 1.6 acres in Westhampton. 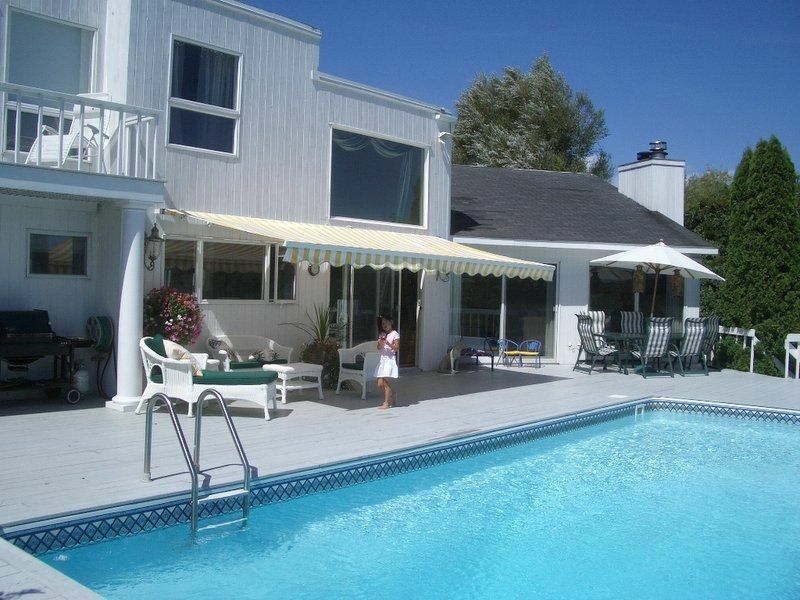 Located off Moriches Bay, enjoy boating or kayaking off your private boat dock w/ access to ocean. Heated pool, Jacuzzi, Treadmill, Stainless Steel Weber Grill and huge deck equipped w/Bose Outdoor speakers and Ping Pong Table..
Great for entertaining or enjoying a peaceful and relaxing day by the pool. Keywords: Waterview, Park like setting summer retreat. Heated Pool, Jacuzzi, Treadmill, outdoor Bose speakers, stainless Weber Grill, 53' HD TV w/surround sound. Our family of 5 had a wonderful week here. The house was very clean, beds comfortable, kitchen well appointed and the setting lovely. We especially enjoyed relaxing by the pool. Bruce is a very attentive and welcoming host who made sure we had everything we needed during our stay--many thanks! This house is the perfect choice for an extended family. The master suite upstairs has a beautiful view of the pool and bay. The three other bedrooms can accommodate 4-6 other members. Most of all, the owner Bruce was so kind and helpful that we felt we were his guests instead of tenants. This was a vacation filled with fond memories for a lifetime.. If you are lucky you too can rent this property! We rented this house at the end of this past summer. Our experience could not have been better. Bruce is a wonderful guy, so helpful with every attribute of our vacation. The house is great, from location to condition, and we had a great time at our getaway to the East End. I highly recommend this house to any family or group.